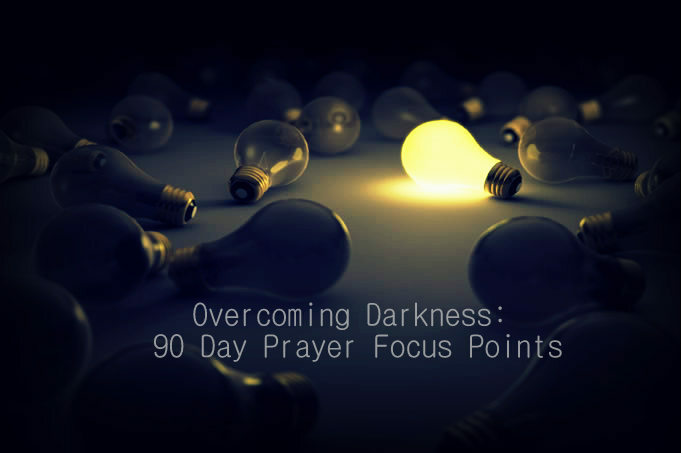 Overcoming Darkness: A 90-day Prayer Focus What is a prayer focus? Day 1 – Read 1 John 4:7-21 – God is the embodiment of love. How is God re-defining love for you in this season? Ask the Lord to reveal any lies the enemy has spoken to you about God’s love. Day 2 – Read 1 Corinthians 13 – Substitute the word “love” for “God” and read this passage out loud. Let the expression of God as love penetrate your heart in new ways. Think of specific ways He has shown this love to you personally. Day 3 – Read Romans 8:31-39 – Do you feel secure in God’s love? Why or why not? What is He speaking to you today about resting in His love? Speak out this affirmation based on this verse: I am secure in God’s love. Nothing can separate me from Him. I am more than a conqueror because of His love. Day 4 – Read Zephaniah 3:14-17 – Ask the Lord to quiet you today in His love. Let go of stress, anxiety, burden, worry, busyness, etc and rest in His love. Day 5 – Read Romans 5:1-11 – How is God’s love demonstrated to us? How do we receive it? What does this (justification) mean for you personally? Ask Holy Spirit to “pour” into you God’s love today! Day 6 – Read Ephesians 3:14-21 – Are you rooted and grounded in love? Ask Jesus for a fresh revelation of the expansiveness of His love for you. Day 7 – Read Ephesians 2:4-5; Jeremiah 31:3; 1 John 4:9 – Ask God to fill you with His life and love today. Let Him wash away any fear, doubt or unbelief that stands defiantly against this amazing love. Day 8 – Read Jude 17-25 – What four things does Jude specifically mention in verses 20 & 21 that we as believers need to be doing? Take a few moments and turn these verses into a personal prayer. Ask the Lord to build your faith, how to pray in the Spirit, to keep in God’s love and experience Jesus’ mercy. Day 9 – Read John 14:8-31; 15:4 and 1 John 5:3 – In John 15:4 Where has the Lord designed for you to be filled and enabled to walk in His commandment? Lay aside your burdens and business for a few minutes. Express your love for Him by abiding, being still, in His Presence. Be willing to receive anything He wants to speak to or show you in that place. Day 10 – Read Matthew 22:34-40 – Ask the Lord how you can love Him today with all your heart, soul and mind. Day 11 – Read Deuteronomy 30:6 and Matthew 6:24 – What does it mean to have our hearts “circumcised”? What is God needing to “cut away” from your heart so you can love Him fully? Is there anything in your life that you love more than Him? Day 12 – Read Luke 11:37-42 – The Pharisees were very precise in outer parts of their lives, but neglected heart issues. Ask the Lord to reveal any area of your life that you overemphasize while lacking in love or justice? Day 13 – Read 1 Corinthians 2:9, 10 – God is preparing great reward for you! He can reveal it to you by His Spirit. Ask Him to show you the rewards of love. Day 14 – Ephesians 6:23, 24 – How do we love God “in faith”? (Hebrews 11:6) Ask God for the grace to love Him with a pure heart. Looking back at Day 1, how has your definition/or understanding of Love for God changed in the last 14 days? Day 15 – Read Matthew 22:34-40 again – What does it mean to love your neighbor as you love yourself? Can you agree with God’s love for you and love yourself as He does? It’s from this place that we can then see others through His eyes and love them. Ask Jesus for grace to love yourself as He does. Day 17 – Read 1 John 4 – How is God’s love perfected in us? What does verse 18 indicate keeps us from experiencing perfect love? Ask the Lord to reveal any place that fear has a hold on you. How does God relate loving one another with love for Him? Why? (John 8:37-45) Let Jesus reveal any person, group or race you are struggling to love. Ask Him for grace to love. Day 18 – Read Romans 13:8-10; 14:1-20 – How is it that we fulfill the law when we love and yet Paul talks in other places that we are not “under law”. For example, Paul focuses on differences in eating and drinking among believers in the early church. Can you think of any examples of “law” in our own modern day churches that could cause division and wounding in the Body? Day 19 – Read Matthew 5:38-48 – Ask Holy Spirit to reveal anyone who is your “enemy” – someone you have difficultly loving in the natural. How does loving your enemy relate to being “perfect” like your Father in Heaven? Day 20 – Read Luke 6:27-36 – What additional insights does Luke add to loving your enemy? How do we become “Sons of the Most High?” What does Luke substitute for Matthew’s “perfect” in verse 36? How does this relate to Mark 11:26? Day 21 – Read 1 Corinthians 13:4-8 – Insert your name in place of “love” and by faith declare this over your life. Remember it is God manifesting this in you, not something you are striving to do. Day 1 – Read Philippians 2:1-11 – Meditate on the amazing humility it took for Jesus as God to take on humanity, becoming one with us in order to save us. Ask God for fresh revelation into the humanity of Jesus. Thank Him! Day 2 – Read John 13:1-12 – What three things in verse 3 enabled Jesus to wash His disciples’ feet? Picture yourself in the scene with the disciples. What was this prophetic act and what was their Master teaching them? What was said to Peter as he protested Jesus’ humbly washing his feet? (John 13:8) As you still yourself, ponder this question as you allow Jesus to humbly kneel before you to also wash your feet. Thank Him for showing you this act of love done in humility. Day 3 – Read the story of the crucifixion from one of the gospels and from a version or paraphrase you haven’t used before (suggestions: The Message or The Voice). Ask God to show you the humility Jesus demonstrated in a whole new way. Day 4 – Read Numbers 12:3; Exodus 18:13-27 and 32:7-14 – What is said of Moses? How do the two Exodus passages highlight Moses’ humility? Think of other stories of his life that exhibit his humility. Day 5 – Read 2 Samuel 6:13-23 – How does extravagant worship demonstrate humility? Can you think of other instances in David’s life that reveal a humble spirit? Day 6 – Read Acts 20:13-24; Philippians 3 – How does Paul’s life show humility? Does it seem a little arrogant of him to say “Follow my example”? What was the example he was talking about? Day 7 – Read 1 Peter 5 – Think back over Peter’s life and the trials he experienced that taught him humility. If Peter were sitting with you today, what would he say to you about being humble? Day 8 – Read Isaiah 53:3-10 – Read this passage thoughtfully twice; once to take it in, then again imprint this heartbreaking gift of love and humility Jesus gave you personally. Read Isaiah 49:16. What does this say about you? Express your love back to him through adoration or worship, dancing, singing, playing music. He loves it all. Day 9 – Read Isaiah 14:12-17; 2 Thessalonians 2:1-12 – Contrast the Lucifer/anti-Christ spirit with the humility demonstrated by Jesus. Ask the Holy Spirit to align you with His mind and heart. Day 10 – Read Colossians 2:8-23 – How does false humility manifest itself? How can you avoid this? Day 11 – Read Luke 18:9-14 – Ask Holy Spirit to reveal fresh revelation to you through this passage today. Day 12 – Read John 13:1-17 – Look back at your responses to Day 2. Do you know (from verse 3) what the Father has given you personally? Do you know where you came from and where you are going? How does this impact your ability to follow Jesus’ example? Day 13 – Read James 3:13-18; 4:1-10 – This book was written by James, likely the brother of Jesus, who did not accept Him as Messiah until after His resurrection. Can you imagine being Jesus’ sibling? Always compared to Him, etc. James knew a thing or two about envy! In this passage, he gives practical advice to overcoming self-seeking, envy and pride. Ask Holy Spirit to reveal any form these have taken root in your heart. Day 14 – Read 2 Chronicles 7:14 – This is the first time in Scripture we are asked to humble ourselves instead of being humbled by God. Ask the Lord to show you how He wants you to humble yourself in this season as part of healing our land. What does that look like for you? Day 15 – Read Romans 12 – Paul gives multiple examples of how to relate in community in this chapter. Note how he starts the chapter and how the themes of love, unity and humility are woven through his instructions. Ask the hard questions, how would you rate yourself in these areas? Ask Holy Spirit to reveal new ways to deal with those areas you are weaker in. Day 17 – Read Matthew 18 – Jesus begins a teaching on humility in response to the disciples’ question on who is the greatest and then addresses offense and forgiveness. Why and how is humility and forgiveness connected? Day 18 – Read Luke 22:24-30 – Despite Jesus’ teaching and example, the disciples were still arguing over who would be the greatest just before his crucifixion. Teaching and example aren’t enough. What changes occurred in Acts that shifted the disciples into practicing humility? Day 19 – Read Titus 3 – Humility isn’t an ethereal concept but something that must be lived out before our spouse, family, friends and community. How do you demonstrate humility in your daily life? Day 20 – Read Ezra 8:21-23 – Why are humility, prayer and fasting often associated together? What area in your life are you needing breakthrough? Ask Holy Spirit if it’s time to fast as an act of humility for overcoming power. Day 21 – Read Micah 6:8 – Are you fair in your interactions with others? Do you show mercy to those who treat you unkindly? Ask the Lord to open your eyes to walk in a new level of humility in your life today. As we near the end our progressive prayer journey together, pray this prayer with me, Dear Ones, as you stand in the love and light and pleasure of our Father, Son and Holy Spirit. Day 3 – Read 1 Corinthians 6:9-11 (emphasis on v. 11); Ephesians 6:25-27 – Praise God that He washes you clean! Rejoice that Jesus has freely given His purity to every believer in Him — no matter what you’ve done or thought in the past. This cannot be earned by you. It is a gift to you. Ask the Holy Spirit to show you any place the enemy has falsely accused you of being unclean. Have you bought into this lie? Repent and receive the full cleansing He has for you. Days–4 and 5 Days 4 and 5 have been combined. The following begins to reveal the depths and heights of God’s love and provision for our purity and cleansing of sin. Let these scriptures permeate your mind and heart over the next 2 days. This way to purity could never come from the mind or religion of man. It shatters every idea that we can do anything to earn our purity. He has made us clean. Praise be to God. Read Revelation 1:4-6; 12:11; Ephesians 2:13; Romans 3:23-26; and 5:8-9. Take time to pause in the next 2 days to deeply ponder the cost of your cleansing. You are walking in the high place now. Though it is a gift to you, it did not come for free. What precious substance has cleansed us, or purified us, from our sins; gives us the enabling power to overcome; justifies us causing God to pass over our sins. Day 6: Read Exodus 12:12-13 and 22-23 – Are you making the connection between today’s scripture and above verses for Days 4-5. It is all about the blood. Do you see God’s hand in His plan thousands of years ago spanning forward into time? The blood on the door lintels and two door posts was a sign, a foreshadowing of a greater fulfillment that would lay ahead. It is called the Pass Over. The final plague of death of firstborns in Egypt was ready to be unleashed, the “destroyer” was poised to be released. But a provision of protection was put in motion. It was a pure act of faith. Moses directed the people to apply the blood of a lamb on the doors 2 lintels and posts of a house. Any first born in a house marked with the blood was saved from death. The destroyer passed over them. That ancient foreshadowing sign of the Passover was fulfilled by Christ as He hung on the Cross and shed His blood. With His final breath “He said, It is finished.” (Jn. 19:30″) The pure blood of the Lamb of God victoriously achieved what was impossible for man. Dear One, Christ shed His blood for you and marked you with it the moment you believed in Him as your Savior. He has made you pure by gifting you with His purity. Father God sees the blood of His Son on you and sees you as perfect. You will not come into judgment. You have passed over from death into life. It is the Blood of the Lamb that was pleasing to our Father and met the requirements of God’s perfection and purity which He knew you could not meet. And that He did it for you. Offer a song or a prayer of adoration to the Lamb who carries the imprint of you upon HIm. Day 8 – Read Matthew 5:8 – What is the blessing of purity? Is it worth it? Do you want it? Day 9 – Read Proverbs 22:11 – What does this verse mean to you? Meditate on this benefit of purity. Day 11 – Read Psalm 24:3-6 – Do you desire to experience God’s manifest presence? How can you enter in? Day 12 – Read Psalm 73 – How did Asaph almost stumble? Where did he find answers to his questions? Ask the Lord to show you any lack of trust that keep you from experiencing the full blessings of the goodness of God. Day 13 – Read Daniel 12:10; James 3:17, 18 – How are purity and wisdom related? Day 15 – Read Psalm 51 – Contrast this Psalm with the one from Day 14. When David stumbled, what was his part to come back to a place of purity? Day 16 – Read James 4:7-8 – If our source of purity is God, why does James say to cleanse our hands and purify our hearts? What part do we play? Ask the Lord to reveal any area of your life you need to cleanse or purify. Day 17 – Read Philippians 4:8 – How does meditation relate to being pure? How does your thought life measure up to this verse? Ask the Lord to help you focus on what is pure and lovely, instead of straying into complaints, grumbling, worry or fear. Day 18 – Read James 1:27 – How does James define pure religion? What does caring for orphans and widows have to do with purity? Ask Jesus what this looks like for you. Day 19 – Read 1 Peter 1:13-23 – How is obedience and purity related? Ask Holy Spirit to show you any area in your life that you aren’t walking in full obedience to Him. Call on Him and His strength. Thank Him, that as you turn to Him and seek Him, He reveals truth and His Spirit indwelling in you gives you the transforming power to follow Him and His ways. Day 20 – Read 1 John 3:1-3 – What hope does John talk about that spurs us on to purity? Day 21 – Read Revelation 19:1-9 – The wedding day is soon! Are you, as His bride, making yourself ready? Oh, how He loves you! Looking forward to that day! Father, we humbly, surrender and turn to You. We throw off the distractions, offenses and lies and fix our gaze on You and who You are, the One True God, Pure, Loving, Humble and full of Unity. Papa, it is by looking to You, spending time with You starring into Your eyes, resisting the enemy, hearing Your truth, standing and declaring Your nature that You with Your transforming power make us more like You. We thank you that as a result we are filled with You, Your true joy and friendship that does not fade away, but lasts forever. To download the prayer focuses, click here.